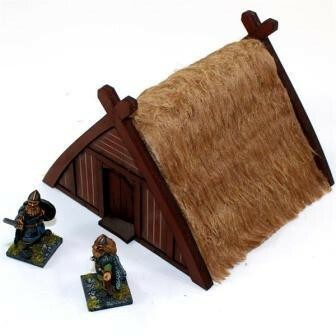 In rural Norse communities this kind of small ‘A’ framed building was used for the storage of harvest but more often than not it was used as a work area for rural craft industry like weaving. A ‘Karl’ or a better off ‘Bondi’ (free born oath giver) farmer might have two or more of these outbuildings within their stockaded homestead, often situated close to the main Longhouse. These ‘Bur’ (huts) were also very common in Norse harbour/port towns (Hafn/Havn). A ‘Kaupamadr’ (buyer and seller) would have one or two outhouses behind his merchant house/shop as stock rooms. Huts like this would be close by many of the wooden track-ways in town, giving their owners easy access from the track. Even a lowly ‘Bondi’ townsman could have an outhouse behind his family dwelling. Norse venturers are better known to us as ‘Vikingr’ (roving and marauding adventurers) rather than ‘Kaupamadr’ and huts like this were often home to one of the Vikings’ most valuable commodities, Viking ship captains needed huts like this for their newly acquired ‘Anaud’ (enslaved captives) to house them before they were sold on to either new owners or ‘Kaupamdr’ who would sell them on again. ‘Thrall’ (owned servants) were the lowest form of human life, you could be born a ‘Fostre’ (hereditary slave) or enslaved as ‘Anaud’ by Vikings, either way you were now ‘Thrall’ and likely a hut like this would be your future home.